Tutu Melaku launched ‘Tutu’s Fund for the Future’ to help orphaned and vulnerable children in Ethiopia attend school and develop their potential alongside other children from stable homes. She was born and grew up in Addis Ababa among a large and happy family with a passion for good food and cooking. In 1992 Tutu brought her culinary skills to the UK where she founded the multi-award-winning restaurant Tutu’s Ethiopian Table in Reading. Together with Link Ethiopia, Tutu established her Fund for the Future in 2010 to raise much needed money for these vulnerable children. Tutu’s Fund focuses on donations to fund education projects in schools and on the sponsorship of vulnerable children, enabling them the opportunity of a complete education. This is particularly important since they are the group at greatest risk of dropping out of school. Tutu’s Ethiopian Table restaurant has been sponsoring the first group of orphan children – all thanks to donations from her wonderful customers! There are many more children we would love to support. Can you help? For £15 per month you can provide school resources, medical support, extra tutorials and other help for your sponsored child, which ultimately will benefit their wider family and community. If you can help, or would like more information, please email Tutu or Matt. Thanks to Tutu’s Fund for the Future these six children are now sponsored. This means they receive resources including uniform, as well as extra tuition, extra-curricular support (social, emotional), vocational training and mentoring. This support makes a huge impact on their lives. It not only relieves a financial burden for their families but also equips them with skills to grow their life opportunities. In addition to child sponsorships, Tutu’s Fund has financed several projects, for example, a new classroom at Chechela school and a classroom regeneration project at Dosha Elementary School. Here was the original classroom before work started. The project transformed the learning space from a crumbling classroom to a fantastic new learning environment to support Dosha’s students. 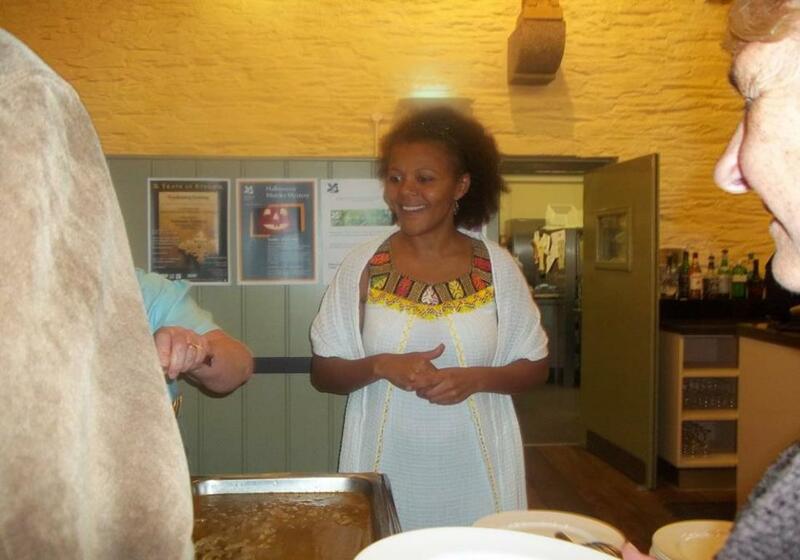 The funds were raised by a school local to Tutu’s Ethiopian Table in Reading. The classroom was emptied and the flaking plaster removed to expose the wooden supports. The classroom was strengthened and re-plastered inside and out, and a new ceiling was fitted. The building is complete! Featuring a sign of thanks for Tutu and Link Ethiopia’s support. Tutu’s Fund also financed a new playground for Dosha’s students to enjoy at break time. 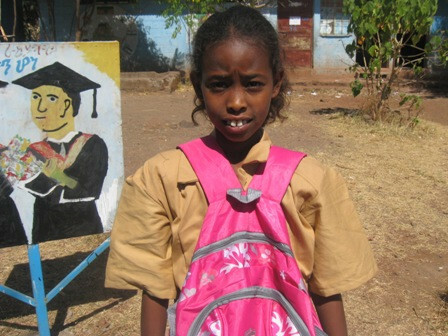 Since 2010 Tutu has held numerous events to raise awareness and funds for partner projects with Link Ethiopia. These have included ‘A Taste of Ethiopia’ night, a cooking workshop with Holy Trinity School, Eat Reading Festival 2016 and assembling a team for the Reading Half Marathon and Green Park Challenge 2016. If you would like to learn more about or donate to Tutu’s Fund for the Future please get in contact! Following the enormous success of Tutu’s Ethiopian Table, Tutu has launched a delicious line of vegan and gluten-free authentic Ethiopian sauces. Tutu can ship these to any UK address so if you can’t make it to her Reading kitchen, you can still experience rich Ethiopian delicacies in your own! 10% of all sales are invested in Tutu’s Fund for the Future, contributing to our work of providing nationwide quality education in Ethiopia. Tutu has created two special products so far, Misr Wot (which is the most popular dish at her restaurant) which comes in a 300g pouch and Mayaba sauce in a 200g jar. Misr Wot is a delicious lentil stew packed full of traditional Ethiopian flavours. The pouch is ready to heat and eat. At home, try it with other sourdough breads, rice or couscous. The second item is a 200g jar of Mayaba sauce, fantastic for cooking, dipping and spreading. It has a tomato-based flavour with added spice and a touch of chilli heat. Use it to make a mouth-watering pasta sauce or add a dollop to the side of your plate to liven up your lunchtime sandwich. The sauces cost £3.50 each. Please email Tutu to purchase.